The European Commission has announced an investment programme worth over €10 billion for low-carbon technologies in several sectors to boost their global competitiveness. The Commission aims to launch the first call for proposals under the Innovation Fund already in 2020, followed by regular calls until 2030. The Innovation Fund will pool together resources amounting to around €10 billion, depending on the carbon price. At least 450 million allowances from the EU Emissions Trading System (EU ETS) Directive will be sold on the carbon market in the period 2020-2030. The revenues of these sales depend on the carbon price, which is currently around EUR 20. GEOLAC 2018 brought together 200 delegates from 30 countries, and this year’s conference is expected to be even more substantial. Join government officials, utilities, developers, and capital providers as they showcase projects and funding programs, facilitate critical new relationships, and tackle obstacles to development in LAC. 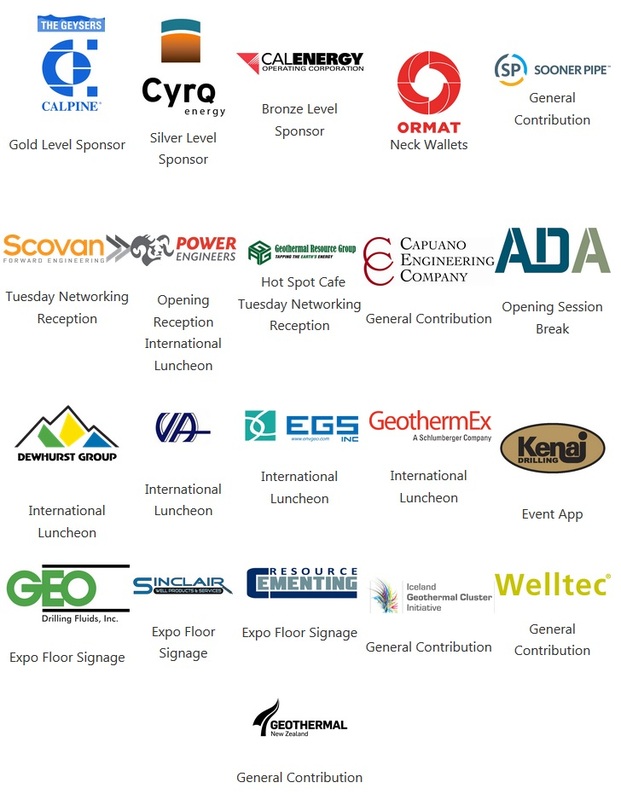 Registration and agenda details available soon at newenergyevents.com/geolac. Exhibitor Registration Now Open! - 23 Exhibitors have signed up already! The February issue of the European Geothermal Energy Council (EGEC) Newsletter is now available. Initial test to the geothermal injection wells at Puna indicate higher temperatures at the reservoir with no sign of negative impact on pressure. Isaac Angel: We continue with our efforts to resume operation. We have already constructed a new access road to the power plant, drilled a new fresh water well and started to open production wells that were plugged due to the lava eruption. Also an additional rig is being dispatched to the island to enable us to drill additional wells, if it is necessary. Along with this rapid and hard work come some encouraging news. Initial test to the geothermal injection wells at Puna indicate higher temperatures at the reservoir with no sign of negative impact on pressure. We are working with HELCO, the local utility, to replace the substation that was destroyed by lava, and we believe that they are doing everything that is required to be ready to take our power online. In light of that, we currently estimate that we will be ready for the operation towards the end of 2019. Last week, I was in Hawaii, visited the power plant, and I talked with both the governor and the mayor as well as with the management of the Hawaiian utility. And they assured me that they are doing everything that they can to help us meeting our target to resume operation by the end of the year. 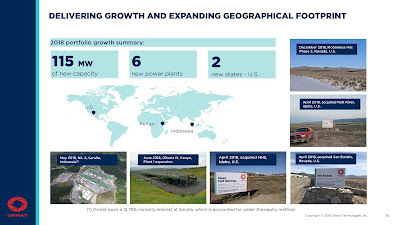 Obviously, the successful operation of Puna power plant is significantly dependent on the results we will receive from the geothermal wells after we open them and from the operation of the power plant equipment towards the end of the rebuild process. Recent developments suggest extended capability of geophysics in exploration of geothermal fields and renewable-energy storage, using both surface and downhole measurements. This conference will be the first one to focus specifically on the geophysical developments dedicated to this goal. Case studies showing application and challenges of geophysics for exploration and evaluation of geothermal and renewable-energy storage, as well as research results indicating trends, important solutions, and future possibilities are welcome. 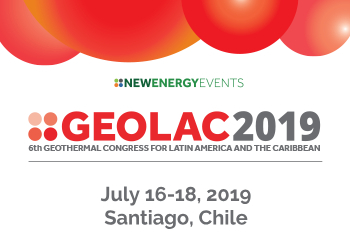 Professionals from academia, research centres, service companies, operators, and energy companies are invited to take part and present in this conference, which is to be held between 8 and 12 September, 2019 in The Hague, a city where geothermal energy is chosen to play a major role in the coming decades. The top three global countries are the U.S. (3.4 GW capacity), the Philippines (1.8 GW) and Indonesia (1.6 GW). We know this because of a global geothermal energy dataset the Joint Research Centre (JRC) has been updating since 2014. The data has now been made publicly available, with a wealth of information for assessing the global market for geothermal power. The dataset covers all 366 geothermal power plants that exist across the world. It shows how the cumulative capacity of geothermal power has increased steadily and almost linearly since 1985, reaching about 10.4 GW in 2017. Beyond capacity, there's also a wealth of technical and market information about geothermal power plants, including turbine type, reservoir information and turbine manufacturer. Ormat Technologies, Inc. today announced financial results for the fourth quarter and full year ended December 31, 2018. American Council on Renewable Energy (ACORE)’s Renewable Energy Policy Forum is the leading pan-technology renewable energy summit to address federal and state policy. Featuring engaging discussions between industry leaders and key elected officials, the forum offers a pragmatic perspective on challenges and opportunities in the new Washington landscape. The Renewable Energy Policy Forum convenes 250 industry executives from more than 160 companies in the renewable energy sector. Featuring financiers, developers, energy experts, policymakers, and other senior officials, The Policy Forum is the can’t miss event for the latest on policy, investment, and market trends. Eden GeoPower Inc. is revolutionizing the energy industry by combining renewable energy and blockchain to develop off-grid geothermal resources. The value created will be in the form of a security token built, designed, and distributed by Eden. support and develop future technologies for commercialization of “Enhanced Geothermal Systems”. Our company's goal is to be directly involved with the development of over 10 GW of renewable energy infrastructure over the next 30-years. Each geothermal power plant that we develop will be capable of producing up to 50 MW of renewable geothermal energy, for up to 30 years, and at a levelized cost of electricity (LCOE) below 5c/kWh. To do so, Eden GeoPower will be financing each of its power plants’ capital investment through the digital issuance of a Special Purpose Vehicle (SPV). This digital SPV will take the form of a token, and will grant its holder (investor) ownership of a project, as well as recurrent dividends from that project’s net earnings. Una vez cesa la actividad minera, todas aquellas zonas que anteriormente se desaguaban para poder desarrollar la actividad pasan a inundarse de forma natural, convirtiéndose en un gran embalse subterráneo. Las condiciones físicas, como la profundidad (la temperatura aumenta con la profundidad), la estanqueidad o el aislamiento, proporcionan una determinada cantidad de calor al agua acumulada. Ese calor hace que el agua de las minas sea idónea para su aprovechamiento geotérmico. (From Google Translate) Once the mining activity ceases, all those areas that were previously dewatered to carry out the mining go on to flood naturally, becoming a large underground reservoir. Physical conditions, such as depth (temperature increases with depth), pressure or insulation, provide a certain amount of heat to the accumulated water. This heat makes the water in the mines suitable for geothermal use. On Friday, February 22, Arctic Green Energy and Beijing Research Institute of Uranium Geology (BRIUG) signed a Memorandum of Understanding on cooperation in the field of geothermal exploration and utilization. The cooperation will be focused on high-temperature geothermal fields in China with the goal of developing electric power generation projects. BRIUG is a multi-disciplinary and well-equipped research institute. It is the only national uranium geoscientific center in China. BRIUG is supported by China National Nuclear Corporation (CNNC) which is a large state-owned enterprise founded in 1955 in Beijing. BRIUG employs approximately 600 scientists, engineers, support staffs and students. It is authorized to confer master’s degree and doctor’s degree and serves as a work station for post-doctoral scientists. BRIUG is also responsible for geothermal resource exploration in high-temperature areas in China. Drilling related to this country’s geothermal project is expected to begin in April this year, and by June, the government will have an idea of the full extent and quality of our geothermal resources. According to Prime Minister Dr Ralph Gonsalves, US$15 million, a soft loan, has been secured from the Abu Dhabi Development Fund (ABDF) and that money will be utilized in the drilling phase of the geothermal project. The Prime Minister said on Tuesday that the drill rig is on its way to St Vincent and the Grenadines (SVG) and by April 2, over 100 containers of equipment will arrive here. New Zealand's second Māori-owned dairy plant project is on track to start producing in July. Poutama Trust chief executive Richard Jones told Dairy News that export grade products like organic whole milk powder, milk protein concentrates and butter will be produced at the plant. The plant, located at the foot of Pūtauaki, a volcanic cone in the Te Moana o Toi region, will be geothermal powered. The combination of a focus on the people, land and customers will give Kawerau Dairy a point of difference and enable it to be a value-add niche producer rather than a commodity seller. “It’s essential that the world makes the transition very quickly to renewable energy. We know that there are a lot of systemic issues involved. Geothermal has unique traits that can help to ease that process,” said Jack Norbeck, Energy Resources Engineering PhD ‘16, also a GRC Member. TWI, a U.K.-based independent research and technology organisation, will coordinate part of a new €17 million collaborative project to develop technologies to allow geothermal plants to cost-effectively respond to network heat and power demands. The project, which is funded through the EU’s H2020 fund, has 19 partners across Europe, with TWI overseeing a €3.8 million budget to combine thermal energy storage with flexible organic rankine cycle (ORC) solutions to provide a highly flexible operational capability for geothermal installations. The project aims to find methods to store heat energy when demand is low so that it can be released later at times when demand is high. This will not impact critical infrastructures under variable energy generation as the approach will not influence the flow condition at the wellhead. The project also plans to create a hybrid cooling system for the ORC plant that will prevent efficiency degradation due to seasonal changes and thereby improve efficiency. Nowadays no one is really surprised by the news about the drilling of a well to extract geothermal energy, but geothermal energy actually does not have such a long history at all in the Netherlands. Only in 2007 was the first well connected to tomato grower A & G van den Bosch from Bleiswijk. Meanwhile, the 'club' has grown and all partners together can tackle a geothermal energy project in all its aspects. Actually just like it was done at the very first project, for which the first discussions were held in 2005. Ten years later, the industry is increasingly able to meet the growing demand for geothermal energy safely and with high-quality installations. In the meantime, 23 projects have been started, of which also a number have come to a halt last year. State utility firm Ethiopian Electric Power (EEP) on Monday signed an agreement with two Chinese firms and one Kenyan firm for the 70 MW geothermal energy drilling project. The two Chinese firms are Shandong Kerui Oilfield Service Group and Shandong Kerui Oilfield Service Group Co. Ltd. Another firm Kenya Electricity Generating Company (KenGen) was also part of the agreement. In a press statement, EEP said the two Chinese firms and one Kenyan firm are expected to supply drilling materials as well as drill wells for possible geothermal energy sources in central Ethiopia. Named the Aluto- Langano geothermal project, it's part of the Ethiopian government's plans to generate up to 5,000 MW of geothermal energy in the coming few years. Ethiopia currently produces only 7.3 MW of geothermal energy. EEP said the agreement with the three firms will see the drilling initially of 22 wells to probe their geothermal energy generation potential. An international research project aims to assess the potential of geothermal energy as a replacement for coal-powered heating in Germany’s western state North Rhine-Westphalia (NRW). “Roll-out of Deep Geothermal Energy in North-western Europe” is co-funded by the European Union and will look into the large-scale use of geothermal energy in four countries. “The Rhenish region (in NRW) should become a model for the switch to modern, innovative and climate-friendly industry,” NRW’s economy minister Andreas Pinkwart said in a press release from the Geothermal Research Centre Bochum. Working with industry partners including energy company RWE, researchers aim just how much geothermal energy would be available NRW -- thought to be more than anywhere else in Europe. A first deep-drilling trial will be carried out near the Weisweiler coal plant, which currently provides much of the energy used for heating in western NRW. Nicola Verruzzi, mayor of Montieri. 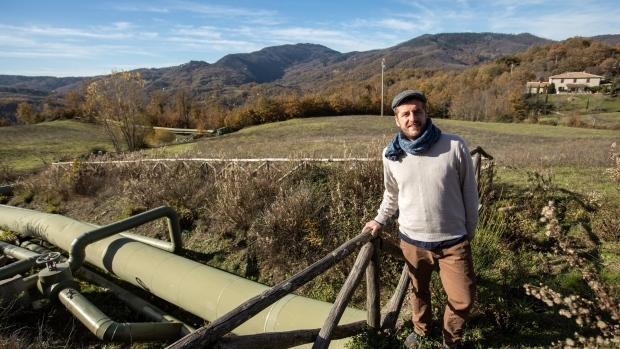 Nicola Verruzzi, mayor of a small Tuscan town (Montieri) that runs entirely on geothermal power, says he’s going on a hunger strike to raise awareness about a new strategy that doesn’t include continued incentives for the energy source, which provides about 30 percent of Tuscany’s electricity. Veruzzi, 35, says he’s yet to receive replies to the dozens of letters he wrote to Economic Development Minister Luigi Di Maio and to Davide Crippa, the undersecretary responsible for energy policy, in protest at the delay in renewing incentives for geothermal production. In the heart of Tuscany, beer is flavored with sustainability. In addition to water, malt, barley and hops, the brewery “Vapori di Birra” in Sasso Pisano, in the province of Pisa, uses a special ingredient in its recipe: geothermal energy. Located in the heart of the Tuscan geothermal area, “Vapori di birra” is the first Italian brewery to use the heat from the earth for its production, continuing the centuries-long history that links Tuscany to geothermal energy. Not far from the brewery, you can find Enel Green Power’s historic Sasso 2 geothermal plant, remodeled in 2009 and equipped with 20 MW of installed power. Through a system of carefully studied ducts that are shared with district heating, the vapor from the plant is routed toward the brewery, which uses it for all the beer production phases that require heat. The vapor gets to the brewery at about 230° and, with a heat exchanger, is turned into water heated to 136° and inserted in a closed circuit. Editor's Note: Klamath Brewery in Klamath Falls in southern Oregon also uses geothermal heat for it's brewing operations. Near-surface geothermal energy could cover a large portion of our energy requirements. Nevertheless, this regenerative energy source is not used optimally. In order to change that, scientists in the EU project GRETA (Geothermal REsources in the Territory of the Alpine space), led by the Technical University of Munich (TUM), have mapped the potential of near-surface geothermal energy in the Alpine region and have formulated guidelines for its use. An invisible wealth of regenerative energy is concealed beneath the ground we walk on: geothermal energy. Inside the earth temperatures range up to several thousand degrees centigrade. And even if the temperature drops towards the earth's surface, there is still enough warmth to be used efficiently. At depths of up to 400 meters, experts refer to near-surface geothermal energy. The Geothermal Risk Mitigation Facility (GRMF) has approved a Sh1.3 billion grant to the Geothermal Development Company (GDC). The grant which will facilitate the drilling of up to six geothermal wells and support the development of key infrastructural works at the Baringo – Silali Geothermal Project in Kenya’s North Rift region. The Baringo – Silali Geothermal Project being developed by GDC, covers three geothermal prospects (Silali, Paka and Korosi) from which the company is looking to produce a total of 300 MW by 2030. The GRMF grant will fund 40 per cent of the costs associated with the drilling of two geothermal wells in each of the three prospects and 20 per cent of the total costs incurred during the development of requisite infrastructural work in the project area. The Geothermal Technologies Office (GTO) hosted its first Quarterly Update of the year on February 19, 2019. GTO Director Dr. Susan Hamm and Assistant Secretary for Energy Efficiency and Renewable Energy Daniel Simmons updated the geothermal community on progress and priorities at the U.S. Department of Energy. If you weren't able to attend the webinar — or if you'd like to review the topics again — the full presentation is now available on the GTO website. GTO welcomes ideas for topics to be discussed at future Quarterly Updates. Feel free to email topics to the GTO mailbox: DOE.Geothermal@ee.doe.gov. The Geothermal Resources Council is pleased to invite you to exhibit at our annual geothermal energy conference. Exhibiting at the GRC Annual Meeting & Expo offers a tremendous opportunity to meet and network with other members of the geothermal energy community, as well as keep up on the newest advances in relevant technology. This year, the conference will be held from September 15-18 at the Palm Springs Convention Center in Palm Springs, California. The Expo will be showcased in the Oasis 1 & 2 Ballroom. We look forward to your participation in this exciting event. The 3-day expo will provide ample opportunities for networking. 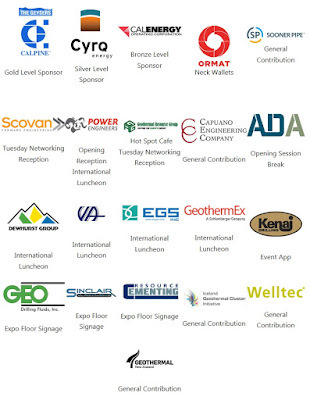 The GRC Expo presents exhibitors with the opportunity to maximize their exposure at the largest annual geothermal gathering in the world. This is the event to learn about the latest developments in geothermal energy. Last year, the GRC Annual Meeting & Expo hosted more than 1,000 representatives from 34 countries. In 2019, we anticipate an even larger audience. Indonesia: 8th ITB International Geothermal Workshop 2019 is Next Month! Register Now for IIGW 2019! Help shape the global geothermal agenda and join the Board of the International Geothermal Association (IGA). Nominations for Board Term 2020 – 2023 are now open. Get the guidelines, get nominated, and run for election. We want diversity, passion and commitment. If that sounds like you, join us! Deadline 16 April 2019, 0:00 CET. Groß-Geothermie: Dritte Bohrung bald am Netz – folgt weitere Bohrung? Die dritte Bohrung zur größten Geothermie Österreichs, die weite Teile Rieds und Mehrnbachs mit umweltfreundlicher Heizenergie versorgt, soll dieser Tage via Pumpversuch ans Netz gehen. Eine dritte Bohrung war wegen großer Nachfrage nötig geworden. Der Bohrturm ist bereits abgebaut, in wenigen Tagen soll die Verrohrung an der Oberfläche abgeschlossen sein, so Helmut Binder, Geschäftsführer der Energie Ried, auf OÖN-Anfrage. (From Google Translate) The third well at Austria's largest geothermal energy project, which supplies large parts of Ried and Mehrnbach with environmentally friendly heating energy, is due to go online after pumping trials these days. A third hole became necessary due to high demand. The derrick has already been dismantled, and in a few days the piping on the surface will be completed, according to Helmut Binder, Managing Director of Energie Ried, at the request of the OÖN. American geothermal firm Orpower4 pocketed Sh11.3 billion ($113 million) in geothermal power sales in the last financial year, cementing its spot as the top independent power producer (IPP) in Kenya. OrPower4 is a subsidiary of US-based Ormat Technologies Inc. and is currently the only private company generating geothermal electricity in Kenya. The American firm has an installed capacity of 139 megawatts (MW) of steam power in Naivasha’s Olkaria steam fields, accounting for 20 per cent of Kenya’s total installed geothermal capacity of 690 MW. 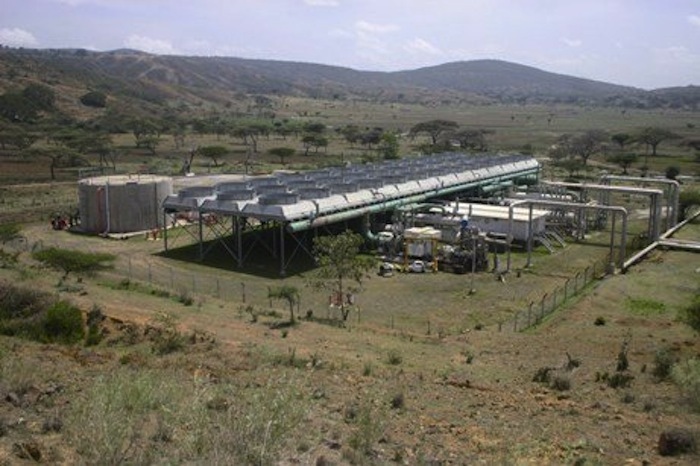 OrPower4 operates Olkaria 3 Unit 1-9 plant, along with wellheads. Cerro Pabellon is South America's first geothermal power plant and the world's highest geothermal power plant. 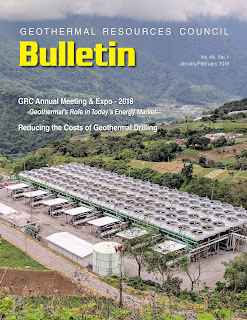 The GRC Bulletin reaches nearly 1,200 geothermal professionals six times per year. Advertising in the GRC Bulletin means your product or service will be seen in the world's only publication that deals exclusively with technical topics, legislation, scientific inquiry, special events and educational topics related to the geothermal energy industry. For GRC members the rates start at just $125 an issue for a business card-sized advertisement. For a half page ad the rate is just $400 each issue. For a full page the cost is just $625 each issue. In addition, when the Bulletin is published an email announcement is sent to the global geothermal energy community. A banner advertisement is available on this email that will be seen by over 4,500 recipients. The rate for GRC members for this tremendous opportunity is just $500 per issue. The GRC services the global geothermal energy community with news and information. Advertising through the Bulletin is a sure-fire way of getting your company (institution, event) in front of thousands of pairs of eyes! Interested in getting noticed! Of course you are! Contact Chi-Meng at cmoua@geothermal.org or 530.758.2360 ext 105.
in the background. Photo Ian Crawford 2013. GeoGenCo, LLC, of Las Vegas, Nevada, has completed their semi-final designs for their next generation True Geothermal 20-megawatt (MW) power plant in Imperial Valley, CA. GeoGenCo has a 15 MW Power Purchase Agreement with Imperial Irrigation District (IID) and expects to be providing power by June of 2020. GRC Member Jim McIntosh (Mac), GeoGenCo's CEO and COO states, "The project is identified as True Geothermal because all current geothermal projects require substantial amounts of water or steam as part of their power generation process. and are therefore, more appropriately known as hydro-geothermal since water is a mandatory part of the geothermal process (either in the form of brine or steam) for both the extraction of heat and for the disposal of the residual brine." The 2019 Geothermal Resources Council Registry of Geothermal Services & Equipment (aka the GRC Yellow Pages) will now be available in a new format - as a public webpage on my.geothermal.org. This will provide better visibility to advertisers and easier access for those who are searching for up-to date information on geothermal services and/or equipment. Contact Anh Lay at alay@geothermal.org for more information. Don't delay, advertise your services today! Learn about "Fuji Electric and Takigami Geothermal Binary Power Plant Project" and how Fuji Electric's innovative technology fulfills customer's requirements. Introspective Systems, LLC of Portland, Maine, announced today that the company has received a $149,935 Small Business Innovation Research (SBIR) award for work in support of the Department of Energy’s Enhanced Geothermal Systems (EGS) project. Introspective Systems will develop monitoring software that enables EGS systems to be cost competitive and fully integrated into the electrical grid. The project researches new algorithms and analytics methods to provide enhanced precision in the understanding of the complex Geothermal systems being developed in the future. Les travaux de forage sont programmés au cours de l’année 2019, avec l’implantation d’un doublet géothermique. Le puits de géothermie se situera au niveau du Bois Carré, rue Alfred Nobel, au cœur de la Cité Descartes, cluster de la ville durable. (From Google Translate) Drilling is scheduled for 2019, with the installation of a geothermal doublet. The geothermal well will be located at Bois Carré, rue Alfred Nobel, in the heart of Cité Descartes, a sustainable city cluster. Während in der Stadt Basel die Geothermie auf Jahrzehnte hinaus als risikoreich gebrandmarkt sein dürfte, sieht es in der Nachbargemeinde Riehen anders aus. Hier soll eine seit 1994 bestehende Geothermie-Anlage, die 7700 Einwohner mit Wärme versorgt, durch eine neue Bohrung erweitert werden. Dadurch könnten weitere 4000 Einwohner mit Erdwärme heizen. Die Suche nach der geeigneten Gesteinsschicht wird bis in eine Tiefe von 2000 Metern gehen. Ende Jahr wurde eine Machbarkeitsstudie abgeschlossen. (From Google Translate) While in the city of Basel, geothermal energy is likely to be branded as risky for decades, things look different in the neighboring municipality of Riehen. Here, a geothermal plant, which has been in existence since 1994 and supplies 7700 inhabitants with heat, is to be expanded by a new borehole. This could heat another 4000 inhabitants with geothermal energy. The search for the appropriate rock layer will go to a depth of 2000 meters. At the end of the year, a feasibility study was completed. Cornwall’s granite could see the south-west of England’s geothermal energy potential really hotting up. That’s the verdict from the British Geological Survey, which is working as part of a £1.8 million research project, named Geothermal Power Generated from UK Granites (GWatt). The programme, which is funded by the Natural Environment Research Council (NERC) and due to be completed by 2022, will also be undertaken by scientists at Heriot-Watt University (HWU) and the Camborne School of Mines at Exeter University, working with partners Geothermal Engineering Limited, GeoScience and Computer Modelling Group and the Cornwall and Isles of Scilly Local Enterprise Partnership. 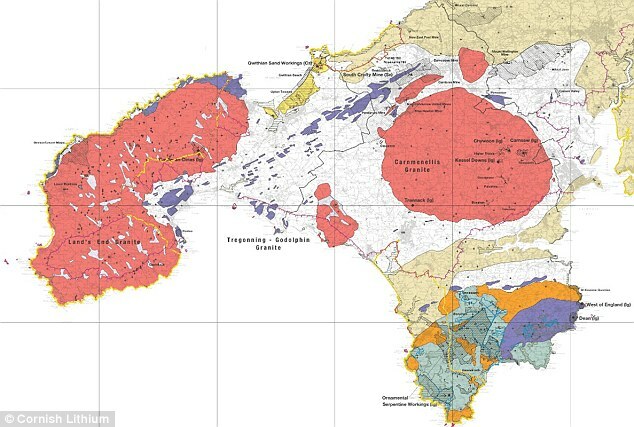 The organisations say the granite of South West England has the highest subsurface heat flow of any rocks in the UK, leading to the highest temperatures at depth. 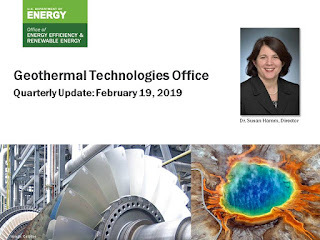 The Geothermal Technologies Office (GTO) is excited to announce its first Quarterly Update of 2019, presented by GTO Director Dr. Susan Hamm on Feb. 19, 2019. To kick off the new year, Dr. Hamm will be joined by Assistant Secretary for Energy Efficiency and Renewable Energy Daniel Simmons, who will provide an introduction for this first Quarterly of 2019. The remainder of the webinar will focus on keeping the geothermal community fully updated on progress at the U.S. Department of Energy, with Dr. Hamm highlighting ongoing efforts within GTO. The webinar will close with a Q&A session open to all attendees.